I love worms. All gardeners do – they are our allies in our campaign for healthy soil! These tiny wigglers make something so wonderful and important: the richest compost EVER – and composting with worms is so easy ANYBODY can do it! I wanted to make certain that any of you who want to make your own worm bins had the info … I didn’t expect any of you to be taking notes while watching The Bonnie Hunt Show! Things have to happen so FAST when doing these little televised ‘How-To’ segments – there is really no way you can understand, remember, and follow the steps for building your own bins and making your own worm compost – so Germi to the rescue! Follow these steps, and you can have the best compost, made by you (with a little help from the tiny slimy ones) that will have your garden practically bursting with joy! especially if we grow our own vegetables! 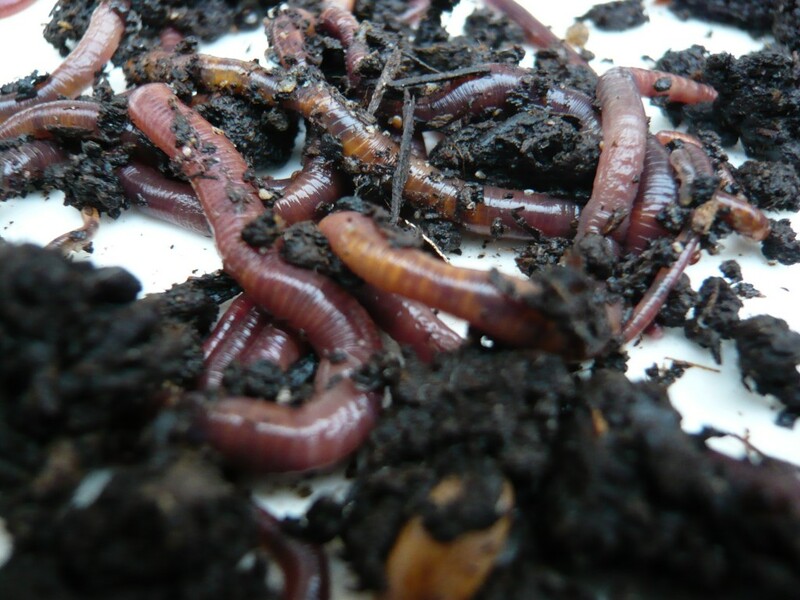 Regular composting can be a little time consuming, and I like to keep things simple – that’s why I love my creepy crawly worms, because they’ll do all the hard work for you! All you need to do is give them a home, feed them your scraps, and in a few months you’ll have the richest, most nutritious organic compost that you made yourself! Step 1 – First, we get plastic tubs. You can get them anywhere pretty cheap – I like the Rubbermaid variety. For one worm bin, you need 2 plastic tubs that can fit one inside the other, with a lid. Step 2 – Drill about 8 or 9 small holes in the bottom of one of the bins (bin #1) and stack it inside the other one. These are drainage holes, and the stuff that drains from worm composting into bin #2 is called ‘Worm Tea’, and it is great to water your plants with! All you need to do to get your te is unstuck the bins and pour your worm tea into a watering can or a spray bottle, and you’ve got some liquid fertilizer! Step 3 - You’ll want to put some window screen that you’ve cut to fit into the bottom of bin #1. This is so the worms don’t crawl out of the drain holes. Step 4 – Now it’s time to build the nest for your worms. Get a bunch of shredded newspaper and fill the bin about halfway up with it. The worms will live in this, but they’ll also eat it, so it’s going to disappear. You should add more shredded newspaper about once a month to keep the whole bin fluffy and aerated. Step 7 – So now we feed. Worms will eat all of your vegetable scraps, stale bread, coffee grounds, used tea bags… The worms will make the compost faster if the scraps are smaller, so I like to chop mine up. I love carrots, so my worms eat a lot of those. Potato peels – give them to the worms. Any icky lettuce from the outside of the head that you aren’t using for your salad… stick it in there! Eggshells, banana peels, stale pasta, you’ll be amazed at all the stuff your worms will nosh on! The things you CAN’T feed them are OILS, MEATS, and DAIRY – they are very hard for worms to digest… and ONIONS, HOT PEPPERS, and ESPECIALLY LEMONS!!! These are too acidic… lemons will actually MELT the worms, so do not go there. But don’t limit yourself to food scraps! Worms LOVE junk mail! They’ll eat cardboard! Dead plants? They LOVE them! Now you have your worms all nice and cozy – just moisten the whole thing with a tiny bit of water to get things going … put on the lid to the bin, and put it in a warm, dark place … in your basement, or a corner of your garage; I even know people who have small worm bins under their sinks! If it isn’t too cold you can put them outside, but worms are most active when the temps are moderate. Add new scraps about twice a week – worms will divide and create new worms to keep up with the food available to them. But try not to put in too much – about 2 cups in the beginning is good, and you can add more as your worms increase. Remember to use the liquid that drains in your garden! Don’t throw out the WORM TEA!!! Use it as an organic liquid fertilizer to water your plants with! So, you are now a wrangler of worms, a farmer of compost. You probably want to know how to harvest this precious stuff! You, being a good worm mommy or daddy, have fed them, moistened them, refreshed their bedding, and made sure not even the tiniest drop of oil or lemon juice nor the smallest bit of meat or dairy or onion got anywhere near your hard little workers. Good job! You’ve kept watch, and you have noticed that the worms have been voraciously devouring everything in sight – your bins are half full of lovely, chocolate cakey looking compost. Don’t empty your bins! Gently push all of the compost to one side of the bin, and build a new nest on the other side. Now, going forward from this point, only put the scraps in the new nest. Soon, the worms will start to migrate to the new nest full of scraps! Give them time – they’ll need a couple of weeks to fully take up residency in the new nest. After you have given them time to set up their new shop, and you’ve poked around in the abandoned worm compost to make sure you aren’t evacuating a straggling worm family from the bin, you can harvest your compost. Some people screen their compost – meaning they pass the stuff through a mesh screen to catch the solids that haven’t been fully processed (they’ll also catch worms that are trying to take the easy way out!). I don’t do this – I’m getting the wormy goodness into my garden beds asap! I don’t have time for any obsessive compulsive garden chores! So as far as I’m concerned, the chunks and the awol worms can make themselves at home in my garden – the chunks will eventually decompose, and the few worms that piggybacked on the compost will just have to do their work in the big bad world instead of the cozy bins. Worm compost is like a supercharged vitamin – use it to pump up your vegetable beds, to make your ornamentals stronger and more resistant to bad bugs, and to give any planting a big ‘oomph’. And be proud that you made it! As far as the worm tea – the drainage that collects in the bottom of the outer bin – I get about a cup a week, and I’ll put about a quarter of that into a spray bottle and spray that onto the leaves of whatever plants need it most (this summer it was all about the tomatoes – right now I have some mandarins that are reaping the misty rewards). The rest goes into a watering can, which I will then fill up with water, and sprinkle worm juice wherever I see fit. Worm tea is power. Whoever wields it has the awesome responsibility of using it wisely! So now you have everything you need to go forth and conquer! Go! Recycle your scraps into the best organic fertilizer for your garden! Your garden feels better already! Thank you so much for posting this! We’ve got a wire-enclosed heap where we’re composting but we’ve *GASP! * been tossing in lemons and onions! oh no! Composting (and recycling) has drastically reduced the amount of trash that we go through, which I think is right up there in bonuses with the “vitamin-boost” it gives my plants. It helps that we cook/eat about 90% vegetarian and there’s always leftover yummies for the worms. Your Mom always said that you and I were so much alike – I think it is amazing that you are such a gardener! I’m a proud cousin/sister! Composting really makes a huge difference in the amount of waste you need to dispose of, doesn’t it? It feels good to have such a small load at the curb for pick-up; I always get kind of smug. Love you, Sweetheart! Hope to see you in June! Mmmm, worms from Whole Foods? I have never seen those in our Austin flagship store! I will ask about that. Also please let me know if you see “One Light Charcoal” in your Whole Foods store this summer, I am curious, it is a product I am involved with. I’m sold! Thanks so much for posting this. I finished setting up my veggie beds this weekend, so this is great timing. My tomatoes thank you! We recently did a trade for some adspace for some worms. Funny I know… but still. We have only had them for about 2 weeks and I can vouch for the fact that they eat more than you would think!. We have yet to harvest the casting – but soon enough! Thanks for the info. Yes, ESP – Whole Foods (here in the LA area, at least) sells a little cardboard bucket of earthworms, right alongside the tiniest, most precious handful of earthworm castings. I only saw them last spring and then they went away for the summer – too hot for them to be set up outside, I guess. And I’ll be happy to be on the lookout for your charcoal! Anything to help a like-minded garden fiend! Hey neighbor! I just couldn’t sit on this … I mean, I have the info – Conde Nast will just have to put everything into perspective. I sincerely doubt they’re reading my little garden blog, anyway, so I think I’m pretty safe. And it is so easy to compost with worms! If you are veg gardening, it’s a perfect compliment to the whole practice … I’m glad I posted on time to be of service! Thant’s what a good Germinatrix SHOULD do! – and what a lovely thing to say, that you’d want the old blog in a reference binder! It IS a big drag that they took the whole site offline – there was such great info from Nick, from Cathy, and I was very proud of what I did. Very short sighted of them. But I’d determined to re-visit all of what we talked about and create an even BETTER blog, with everyone’s help. Afterall, the comments are where everything comes alive. We learn so much from each other, you know? Welcome to the wonderful world of WORMS! It is pretty amazing to watch them in action. And they behave differently in every garden, just like plants do. I’ve read that some people notice their worms don’t eat potato peels … mine totally go for them. Mine seem to devour everything in sight. They are real ‘foodies’. This is a great time to be starting because they work faster in warm weather. You’ll be harvesting your castings in no time, and you’ll be so shocked at how much difference just the worm tea makes in the perkiness of your plants. Adspace for worms? High five! I love barter! Conde Nast can bite me. There, I said it. HA HA HA!!!! Right on, SUSA!!! You are such a good VP – I can always count on you to tell it like it is, my friend! Thanks for getting the worm info out there! I have heard differing things about what they can and can’t tolerate – the “worm guru” gal who wrote “Worms Eat My Garbage” put onions and grapefruit rinds on the “yes” list, interestingly. My new worm bin is GIGANTO and I worry that I didn’t put enough bedding in. Maybe I will add some more so the worms have a lot of space to wriggle around. This is such an exciting venture for us, I cannot tell you! Oh, Karen, you are going to LOVE Worm Composting! I am so proud of my worms – I make everyone who comes over for dinner take a trek out to visit them. They are so great! Yes – give them a really generous amount of bedding – it goes quicker than you think! I try to add more every time I feed them, – it seems to improve the texture of the finished product. So the Worm Gal feeds her worms onions? I am pretty scrupulous about avoiding giving them anything that is too acidic – although once my husband put a few jalapenos in by mistake! When I went in to feed them a couple of days later, the peppers were totally segregated – it was as if all the worms moved to the other side of the bin. They will eat bell peppers, though. But I wouldn’t risk onions – our worms are too precious to risk! You will be amazed, Karen!